You are here: Home / FAQs / How to add a deal? 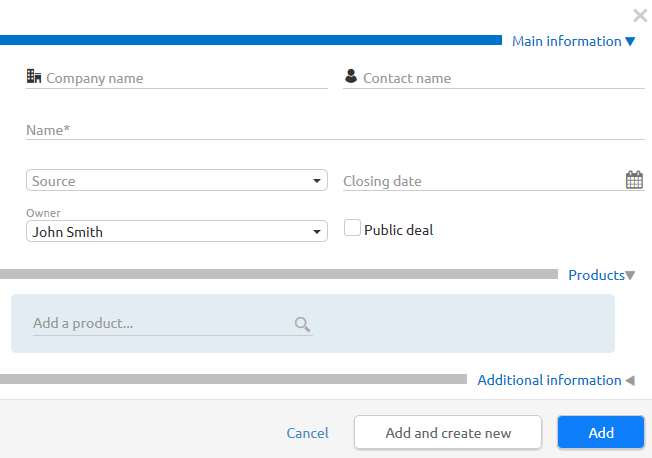 After you have imported and added contacts to Livespace, you can create your first deal. It can be a current deal or one that is already closed. When you do this, you will understand more about how deals work in Livespace. Go to the Deals page. Next, press the Add a deal link. You will see a form that allows you to add a new deal. You can find instructions on how to complete the deal form in this article. Instead of going to the Deals tab, you can use the plus (+) button to create a new deal. Click on the plus (+) button in the upper right corner of the page. Then, select the Deal link. The same deal form will come up. What can also be considered a comfortable way to add a new deal is doing it right on a contact’s profile (it can be either a profile of a company or a person) that you can find listed on the Contacts page. Once you have opened a contact’s profile, you will find there an area called Deals with this company or Deals with this person — and the Add link. In this area, you will find all the deals that are linked to this particular contact. If there are no deals listed, all you will see will be the Add link which you can use to create a new deal with the contact. https://www.livespace.io/wp-content/uploads/2015/10/ls-logo-white1.png 0 0 Joanna Gracz https://www.livespace.io/wp-content/uploads/2015/10/ls-logo-white1.png Joanna Gracz2016-11-30 11:30:522019-04-03 16:09:28How to add a deal? iCal – Google Calendar, MS Outlook integration What are contacts in Livespace?